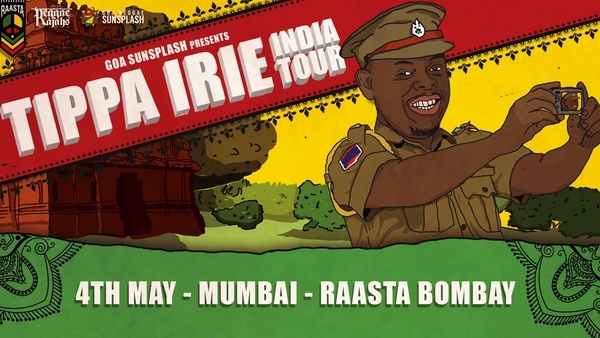 May 4, 2017 at 9 p.m. to May 5, 2017 at 1:30 a.m.
Goa Sunsplash & Reggae Rajahs are delighted to present Tippa Irie's India Tour 2017. His last tour, four years ago, was full of memories - 4 brilliant shows, a recording session, a video shoot and many conversations that were in retrospect, lessons in reggae music! We couldn't be more excited to welcome him back to India. One of the most talented MC's that the UK sound system scene has ever produced, Tippa Irie has over 30 years of experience on the mic. Starting out on the legendary Saxon Sound System in London, Tippa has blazed a trail of lyrical fire over his career with multiple hits in every decade since he started performing. Tippa grew up with strong Jamaican roots and has been a stalwart of the UK reggae/ dancehall scene. However, his versatility and musical prowess means that he is frequently heard on other beats such as hip hop and jungle/ drum n bass. In fact the biggest commercial hit of his career is the collaboration he did with Black Eyed Peas for "Hey Mama". Goa Sunsplash is an annual festival held in January every year that focuses on dub, reggae and dancehall music. Reggae Rajahs are a collective of DJs, MCs and promoters that have been spreading reggae music in India since 2009. © 2018 Sunsplash Entertainment PVT LTD.
Join our mailing list to stay up-to-date with the latest Goa Sunsplash news, tickets, line-ups and contests.